Margaret Thatcher (Meryl Streep), now in her 80’s, is cleaning out her husband Denis’ closet (Jim Broadbent) and thereby putting his ‘ghost’ to rest. While doing so, and with the onset of dementia, she is confronted by memories of her extraordinary and controversial career. The (side) love story between Maggie and her husband (as a ghost and as her foil) is interesting, humourous, and often touching. One can also almost relate to Maggie’s growing fear about her dementia. However, this film plays like homage to a woman who was divisive and ideologically driven and, as presented here, was this way with some justification. Sure, capitalism in theory is compelling, but once you factor in human nature, it’s incredibly flawed. Sure, she was a grocers daughter and so compared to the upper classes she was working class, but she wasn’t to the great majority. Sure, she went to university on a scholarship, but it was to Oxford. Sure, she was a pioneer by the fact of her being the only woman in Parliament at that time, but this was also a marketing tool for her. Ultimately, Great Britain is still reeling from her actions – the miners, the unions, the Falklands, and the Poll Tax to name a few things – and, combined with “Reaganomics” in the U.S., her reign is arguably to blame for much of the disparity of wealth today. 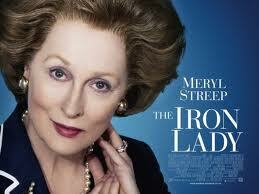 However, Meryl Streep in the title role is absolutely fantastic, and it’s because of her that one should see this film. Hi there Victoria – Margaret Thatcher is still a very divisive figure in British society today. Love her or hate her – without her, the UK would be as sclerotic as France is today. (And to know what THAT feels like, you probably have to live in France…). I really enjoyed this as a great movie, even if the dementia aspects rang a little too true for me (because of my mum…). I met a person yesterday who thinks that France is way ‘ahead of the game’ the way it is today, singing the praises of both de Gaulle AND Hollande!